I got this nice little 30 center out of a box of comics that my friend, and fellow SMC’er, Jason didn’t want. It’s in a little bit of rough shape. Faded colors, curling a little bit, some spider cracks, and creases on the cover. To me, this is a comic screaming to be read. The pages are a bit yellow, but those staples are holding that cover on. It’s a nice reader copy. Something nice to just sit down, and really dive into the comics of it’s time, which for this one would be the middle of the 70’s. I love 70’s comics. They’ve still got a nice innocence about them, and with all this action crammed into one issue, good ones can read like a really awesome Saturday morning cartoon. Let’s zip into this one, shall we? We’ll see how the Flash deals with four nasty villains in this week’s Back Issue Bin to the Future. Time to speed into Flash #244! We open up with a great title page. A large portion of Flash’s rogue’s gallery is here, each with their own little thing to say, trying to convince us, the faithful reader, that they have the best interests of Central City at heart! What? How can this be? The Flash, our trusted hero, is actually the bad guy, and he’s going to destroy the city with a disc-bomb? Whoa! We must read on! It all takes place at the funeral of the Top, one of the Scarlet Speedster’s least known villains (I’ve never heard of him, anyway). Barry Allen and his wife, Iris, who is the ace reporter of Pictures News, are paying their respects, when out of nowhere, Barry’s police radio goes off. It’s a bank robbery in progress with Captain Boomerang! In less than a second, Barry Allen goes from mild-mannered police scientist to Central City’s avenger, the Flash! Just as quickly, Flash arrives to see Captain Boomerang leaving the recently robbed bank with a bag full of… something! Quick to action, the Flash attempts to nab the Captain, but the vile villain is not without his own tricks: Remote controlled flying boomerangs that react to Flash’s speed! Uh oh! After some failed attempts to get rid of the killer boomerangs, Flash is finally able to stop them with an instant waterspout! Captain Boomerang has escaped though, but the Flash isn’t done. Interviewing the manager of the bank, the Flash is quick to discover that no money or other valuables were stolen! Interesting… Flash is called to action again as Captain Cold is attempting to rob a jewelry store! This goes on an on, through several more villains, before it’s finished. What could these dastardly evil-doers want that is so important to them? Can the Flash figure it out in time to save the city? Is he fast enough? I love comics from the 70’s. I LOVE them. For the most part, they’re single issue adventures, jam packed with action, witty banter, and clever heroes. This book is no exception. Cary Bates’ story is, from first page to last, a lot of fun to read. In all honesty, I’ve never read an issue from Flash’s own title. I just never got around to it. All my exposure to the Scarlet Speedster has been from his appearances in Justice League, 52, or any other issues he decided to be a part of. I’m really glad that this was my first. Bates story is very simple, but such a joy to be a part of. From one villain to the next, Weather Wizard, Captain Cold, Mirror Master, Heat Wave, and more, the Flash goes across the city before discovering that the Top has left one more trick for Central City. The discs are triggered to explode, thereby leveling the city, and the villains, for once, want to put a stop to it! They’ve grown accustomed to the city, and only having to deal with the Flash, so moving to the likes of Gotham or Metropolis are not high on their list. Bates writes villain dialogue pretty much the same, but does it matter in a story like this? No. This far into the series, you should already know who Flash’s rogues are, and if this is a first issue, it’s a great way to get started. You’re brought in fairly easily, most is explained in the first two pages of the issue, and then the rest is a fun-filled ride right down to the last page. I think it’s a classic issue from the era, as well as a testament to the character himself. Bates gives us plenty of examples as to why the Flash is the fastest man in the DC Universe and just how exciting a comic book can be. We’re in the middle of Irv Novick’s 9 year run on the Flash, and I think he’s in his stride here. Characters are clearly drawn, motion is distinct, and any emotion shown on the characters is easily recognizable. Irv puts tons of detail into each panel, giving the reader plenty to look at. From Top’s funeral, to battles with Captain Cold and Mirror Master, Novick’s artwork is classic. It’s exactly what you would expect from an issue of the times, and visually, it holds true to what a comic should have been, and what should be now. The artworks visual work really well with the script, with plenty of “Blink and you miss it!” moments that should be attributed to a Flash issue. 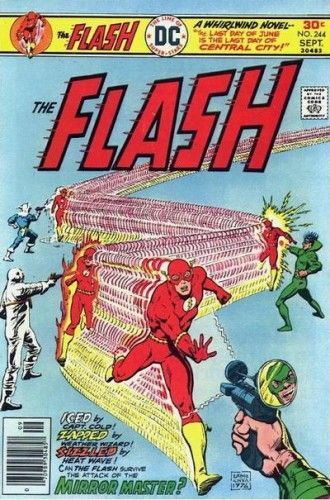 This issue alone makes me want to see more of what Irv Novick has in store for the Flash, and the many other characters he drew during his time in the industry. I enjoy finding comics like this. It’s issues like this that not only remind me to really enjoy what I read, but to also just have some fun with it too. It doesn’t have to be serious all the time, and sometimes, it’s good to just sit back and really get into what’s going on. After putting this down, this is the type of issue I’d put in some kid’s hand and tell him to read. It’s a roll it up and put it in your back pocket issue, sure, but it’s that one issue you could read again and again and never get tired of. Cary Bates script, with Irv Novick (who’s now become my favorite artist of the times) work really well together, and really helps with the charm of the issue. And to think… It came out of a box that was going to be thrown away. Parental Concern: None! Flash is too quick to allow parents to get mad!